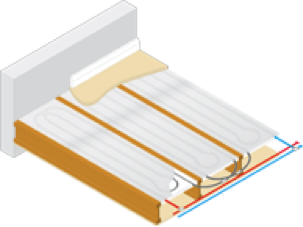 Underfloor heating is great for getting heat evenly spread throughout the whole room and house. Imagine walking into a home with no unsightly radiators or an uncomfortable atmosphere; just a soothing, welcoming warmth from the cold outdoors. 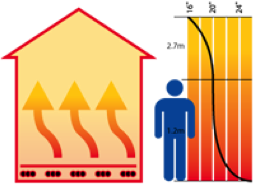 Underfloor heating is the closest to an ideal heating temperature. 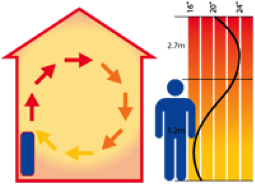 Radiators heat a room inefficiently, circulating heat in a spiral effect that creates cold spots. We use Polypipe underfloor heating systems which deliver all of this and more. Making your house a home. 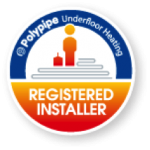 What’s more, with flexible product options there is a Polypipe under floor heating solution to suit every conceivable project and floor type, from single room refurbishments to major renovation or new build projects. is simply slotted into the panel and then permanently covered by the screed. Suitable for all ﬂoor coverings, solid ﬂoor systems can incorporate 15mm or 18mm pipe. holds the pipe above the insulation allowing full screed surround. 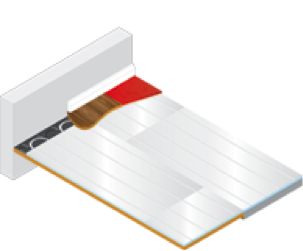 Optimum screed depth is 65mm from the panel base, i.e. 40mm from the pipe top. 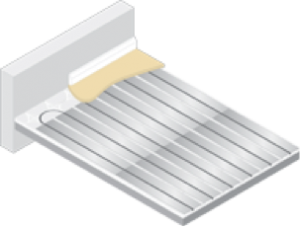 Insulation below and at the edges of the ﬂoor screed is required by Building Regulations. 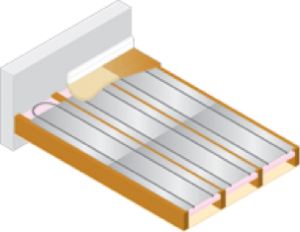 Edge insulation also acts as an expansion joint. The Polypipe floating floor system is designed for use in applications where a solid floor installation is not suitable due to structural weight limitations or where a dry build floor option is required. Suitable for use in either new build or existing properties, the floating floor panels can be installed directly on top of both solid and timber floors.When installed in ﬂoating ﬂoors, Polyplumb pipe is simply pressed in to the pre-formed heat spreader plate, which sits in grooves within the ﬂoating ﬂoor insulation panel. The ﬂoating ﬂoor system is then covered with 18mm chipboard sheeting. Suitable for all ﬂoor coverings, ﬂoating ﬂoor systems can incorporate 15mm or 18mm pipe. For installations in suspended ﬂoors, Polypipe Underﬂoor Heating uses double heat spreader plates. Alternatively, pipes can be laid on top of insulation between joists. Standard tongue and groove ﬂoorboards are laid on top of the system. Suspended double heat spreader plate systems use 15mm pipe. into the panels which are simply installed between the joists, linked together and connected to the manifold. 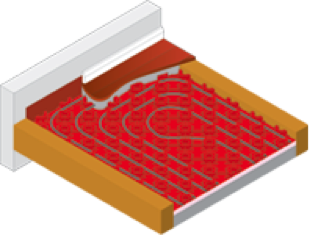 Overlay™ is a unique low profile underfloor heating system ideal for both renovation and new build projects. Installed over the existing floor and only 18mm in depth, Overlay™ allows underfloor heating to be installed where traditional underfloor systems would either require expensive excavation or would require the floor to be raised to an unacceptable level.